Via the Press Center, you have access to our press releases and press download area. Utilization of the prepared content is free of charge. With the use of our Online Press Center, you offer an undertaking to only use the content and materials on offer for the purpose of your professional editorial and journalistic activities. Unless subject to a different agreement, basically the photographic material, data and information have been released solely for employment by journalists and press employees. Within the framework of a simple right of use, the content may only be used for the stated purpose to which the respective materials relate. As a rule, content may be downloaded free of charge and used within the scope of reporting for purposes comprised by press releases, articles in the print media, film and television reports, and publications in the online, mobile and multi-media. Additional utilization for commercial purposes of any description, or private advantage, in particular for advertising, is not permitted and expressly forbidden. Content and material may be processed and altered, as long as its clear recognition is guaranteed and no changes are made to the content that might possibly result in a meaning other than that originally intended. The content may not be used in a form that distorts its meaning and alienation of the material is not permitted. The right of use is limited to the period during which the content is available in the Press Center and in spatial terms, to the geographical area of the activities of our company. Use of the content in an objectionable or illegal context is not permitted and must desist. The transfer and/or duplication of the content to/for third parties is not allowed unless absolutely essential within the scope of the stated purpose. The electronic storage of pictorial data, data transfers and all other forms of duplication are only permitted in the course of standard production procedures and during employment that is lawful and in accordance with the intended use. You, or a third party, are forbidden to employ, store or download content as part of a service that is similar to, or replaces, that which we offer. All content, as well as the design itself, is protected by copyright and personal rights, registered trademark rights and other statutes in connection with intellectual property rights. All the content contained in the Press Center such as copy, photographs, videos, audio files, documents and other content offered in the system are the property of our company, its licensers or external owners, who provide content and are named in the system. When photographs, films or other images are employed, the name of our company and if existent the proven copyright notice, and/or the name of the photographer or agency are to be given. This shall also apply to electronic publications. Except in cases of premeditated and gross negligence, we accept no guarantee that the materials provided do not infringe the rights of third parties, or contravene competition regulations or other legal statutes. We make every reasonable effort to ensure the constant provision of services and functions. However, we accept no liability for the availability of content, or access to the Online Press Center and its functionality. The content provided is prepared without a warranty. We exclude all guarantees of completeness, satisfactory quality and suitability of the content on offer for a certain purpose. In addition, we retain the right to alter all the content contained in the Online Press Center without prior notice. Content may contain links to other websites. We have no control over the web sites of third party providers and are not responsible for their content or any losses or damages that you may incur from the use of such third party provider websites. My personal data filled out will be used by KTM Sportmotorcycle GmbH for the purposes of performing the functionalities of the KTM Press Center, such as, for example, the sending of information on racing series or the company. For these purposes, my data will also be transmitted to the subsidiaries of KTM AG (a list of all group companies can be viewed here) as well as to selected partners (a list can be viewed here). These data will be used, processed and stored with strict confidentiality and in harmony with Austrian and European data protection provisions. Personal data will not be marketed or sold to external companies. Information that is employed within the scope of entry to the press mailing list or a registration for a press log-in must be made on the basis of correct and current data, correspond with the truth and be complete. If necessary, the information should be updated. We retain the right to refuse acceptance into the press mailing list at our own discretion, to block registration to the press login and to refuse access to and/or the use of the services and content on offer. Should you prepare a report on the basis of the content provided, we would be very pleased if you would send us a free, specimen example of the publication to the following address or a link via e-mail. We trust that our press service will provide your work with the best possible support and look forward to your report. 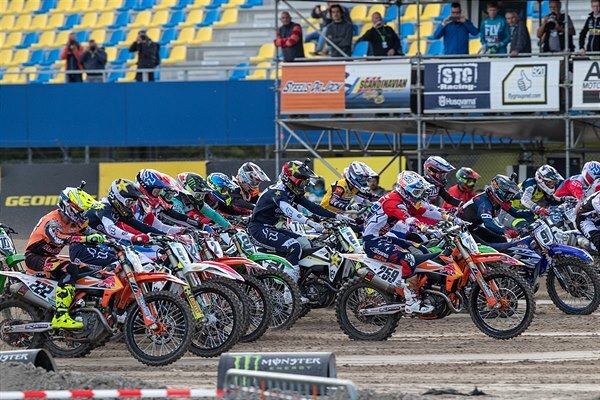 For the fourth year in a row the temporary and spectacularly set motocross course laid over the stadium section of the TT Circuit Assen provided a rough, tight and curvy test. The sand benefitted from a slightly revised layout for 2018 but made largely the same inventive use of space next to the vast grandstand that was filled with most of the 40,000 attendance. 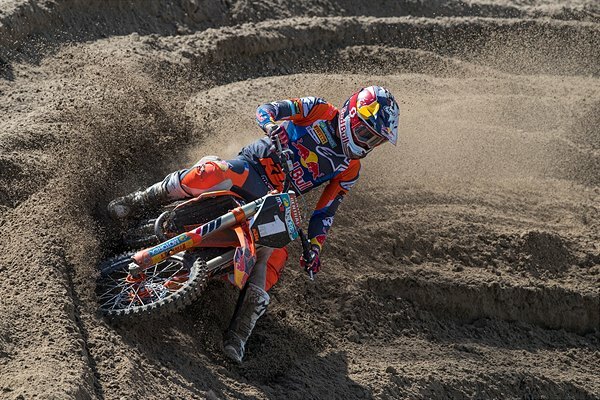 Red Bull KTM came to the 19th round of 20 in MXGP having mathematically confirmed both MXGP and MX2 world titles and expecting to see the first of the season-long duels between Jeffrey Herlings and Tony Cairoli as well as Pauls Jonass and Jorge Prado decided on the bumpy Dutch terrain. 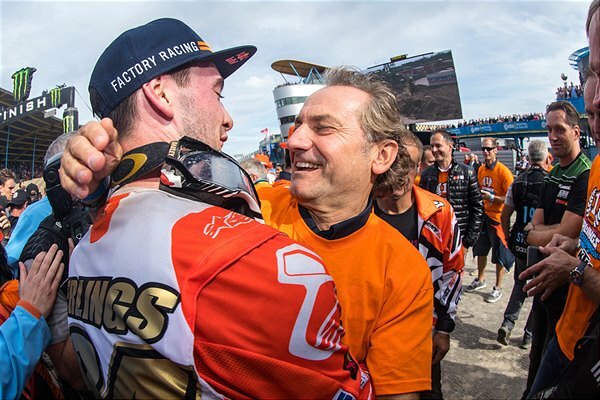 Herlings secured his first world championship with the KTM 450 SX-F in the premier class of the FIM series – becoming the first Dutchman to do so for 30 years - and the fourth of a career that begun with his current Red Bull KTM team in 2010 at the tender age of fifteen. 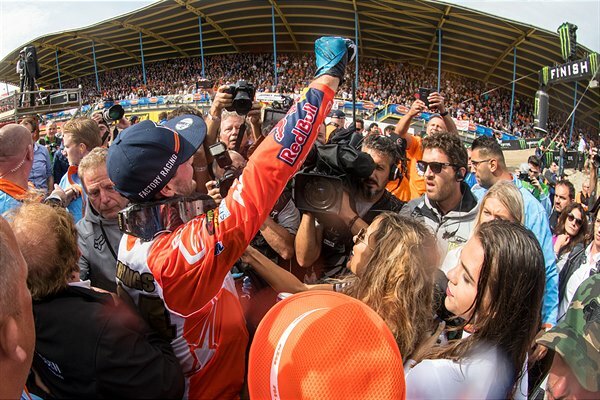 Setting off from the first pick in the gate after posting his twelfth Qualification Heat victory on Saturday, Herlings passed Tony Cairoli before the end of the first lap and was cheered all the way to the chequered flag. The 24 year old cruised to the line almost forty seconds ahead of the pack and began the celebrations. He provoked a gasp from most of the circuit in the second moto with an early race crash but then hiked the entertainment factor by cutting his way through to win once more. 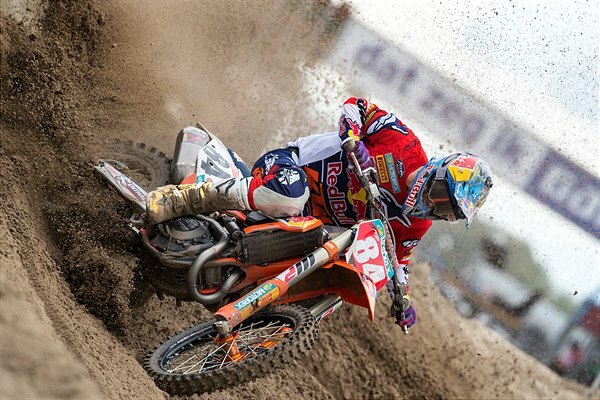 It was Herlings’ seventh Grand Prix triumph in a row and 14th moto success; he was last beaten in Indonesia in July. After 19 Grands Prix (of which he contested 18) and 36 motos, Herlings has won 16 and 31 and never finished lower than third in those 36 starts. He has dropped only 17 points all season and boasts a 100% podium record in just his second season in the category. 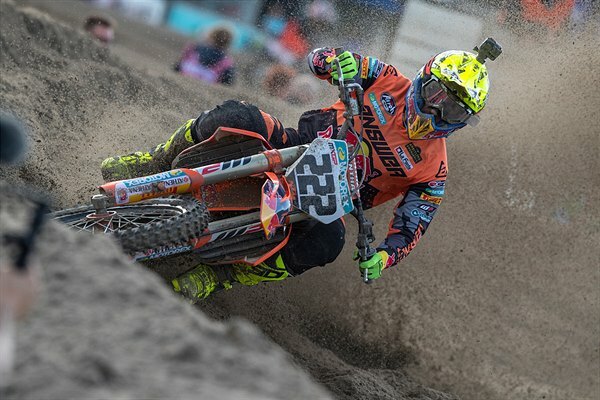 Tony Cairoli sealed the position of number two for 2018 meaning Red Bull KTM has classified 1-2 for the second consecutive year. The Sicilian has finished on the rostrum 14 times despite dealing with small injuries to his thumb, hand and knee and raised his runner-up trophy thanks to a 2-2 at Assen; walking the rostrum for the first time since the Grand Prix of Belgium. Glenn Coldenhoff so nearly gave the team a full podium sweep. 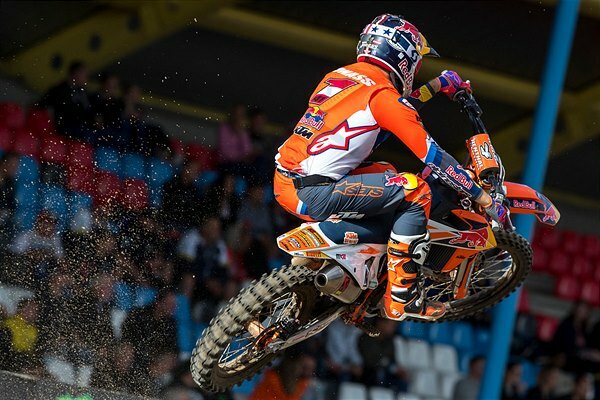 #259 was fast and competitive at the track where he marked a podium finish in 2016 and charged to a fine 3rd position for a Red Bull KTM 1-2-3 in Saturday’s Qualification Heat. He was running inside the top three in the first moto until a frightening crash that saw him topple off the track. He thankfully retrieved his racebike and rode to 5th place. In the second moto – after holeshotting and leading the opening laps - Glenn fought off the attention of Max Anstie to classify 3rd and missed his first spray of champagne this season by just two points. 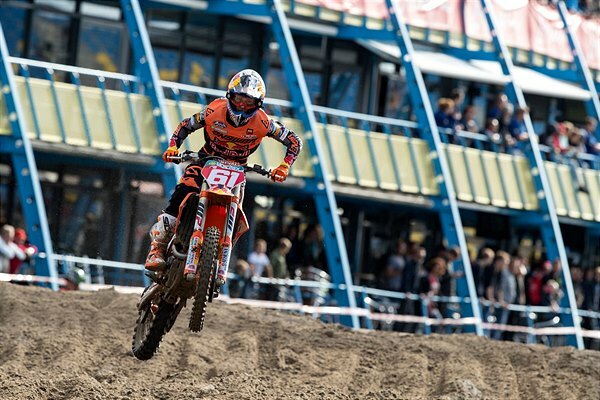 MX2 Championship leader Jorge Prado will carry a 46 point advantage into the final Grand Prix of 2018 (with just 50 points remaining) after continuing his fantastic run of form at Assen. 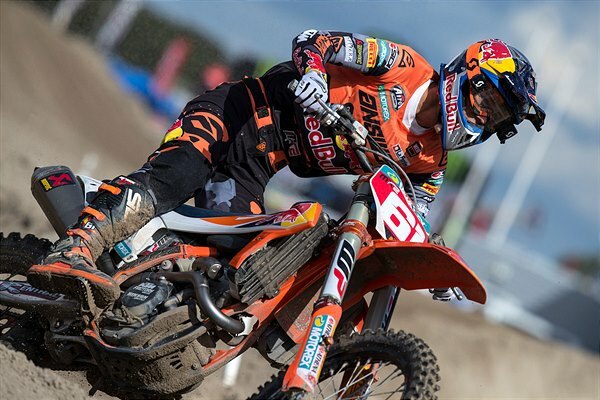 Prado tasted EMX125 title success at the circuit in 2015, a maiden trophy on his debut Grand Prix appearance in 2016 and was victorious in 2017. His eleventh triumph of the season today with clear-cut 1-1 moto performances means he stands close to his first MX2 World Championship in just his second season in the division and with the works KTM 250 SX-F.
Pauls Jonass needed painkillers in his right knee to cope with ligament damage as a consequence of his fall in the Grand Prix of Turkey and has also been unable to train or gain any serious practice mileage for almost two weeks. Despite the adversity the world champion battled back from a first moto, first turn crash and ploughed through the second race to finish 6th overall. 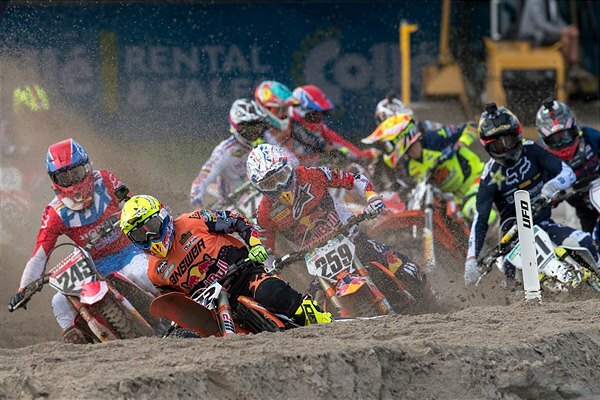 The eight-month MXGP campaign comes to an end in two weeks time with the inauguration of Imola as a Grand Prix venue for round twenty of the season.